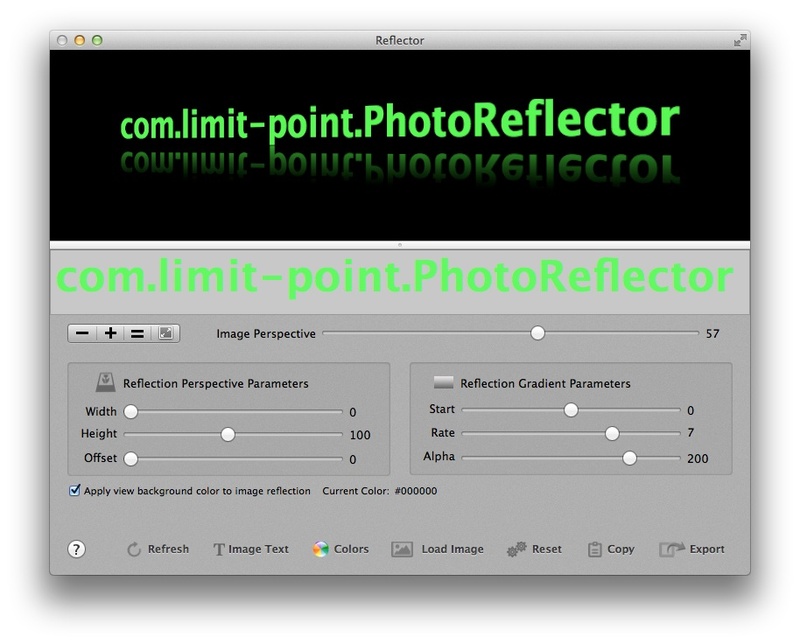 PhotoReflector is available on the Mac App Store. Mac OS X 10.6.8 or greater. Its free iOS companion, Photo Reflect, is available in the App Store. Get the free iOS version for your iPhone, iPad or iPod Touch, Photo Reflect, here. 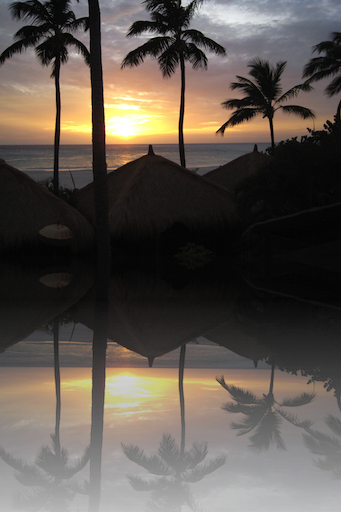 Easily adjoin stunning reflections to your photos and text adding depth and dimension to enhance their appearance. 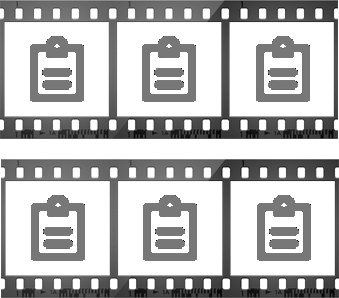 What can PhotoReflector do for me? 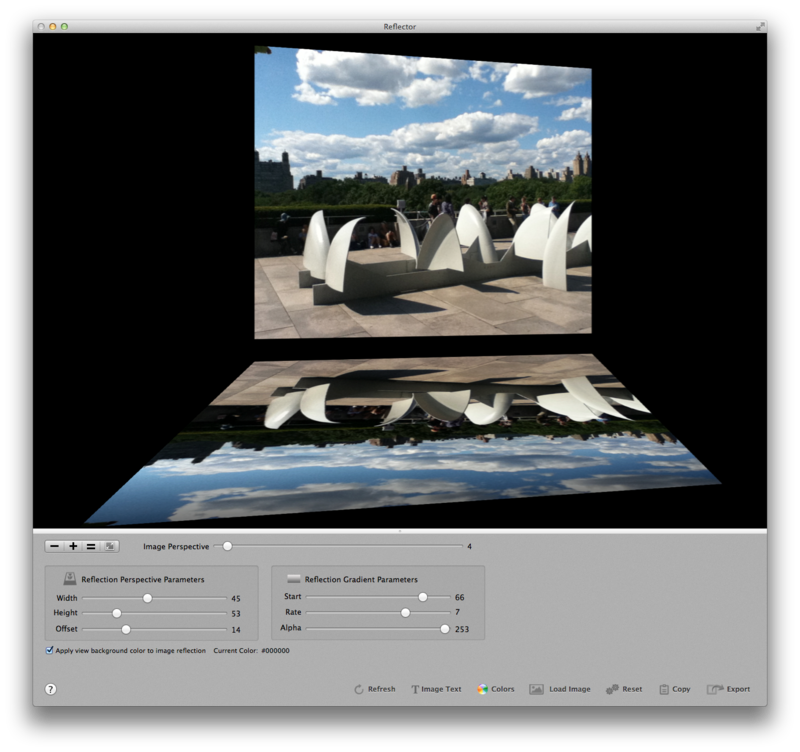 Reflect photos to simulate standing them on a mirrored surface in 3D. Perspectively warp reflected photos to simulate viewing them sideways in 3D. 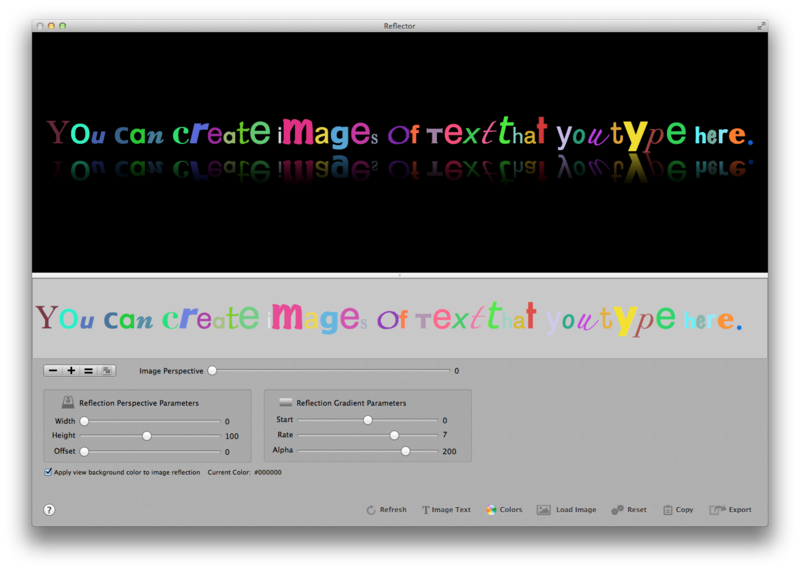 Enter, edit and image rich text, and reflect it just like photos. 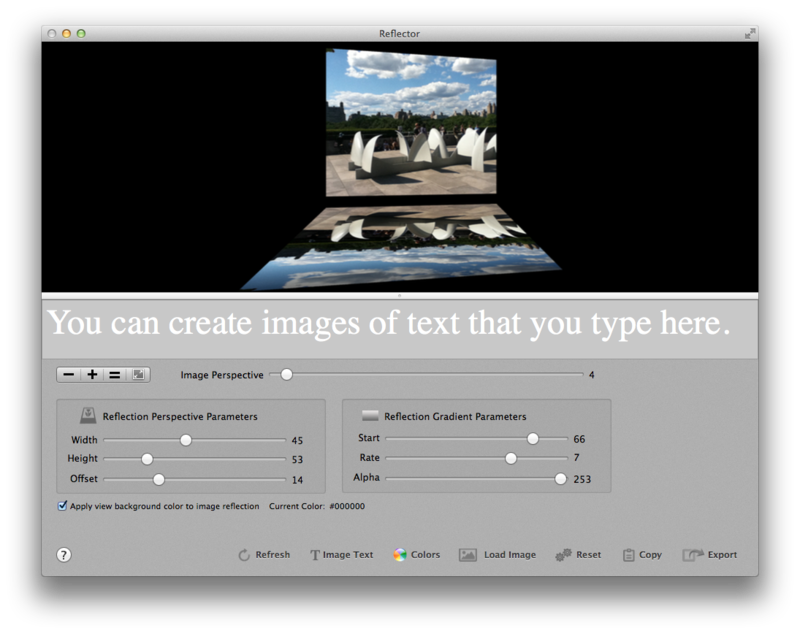 Export your reflected photos to the pasteboard or files in various formats, including transparent PNG and TIFF. 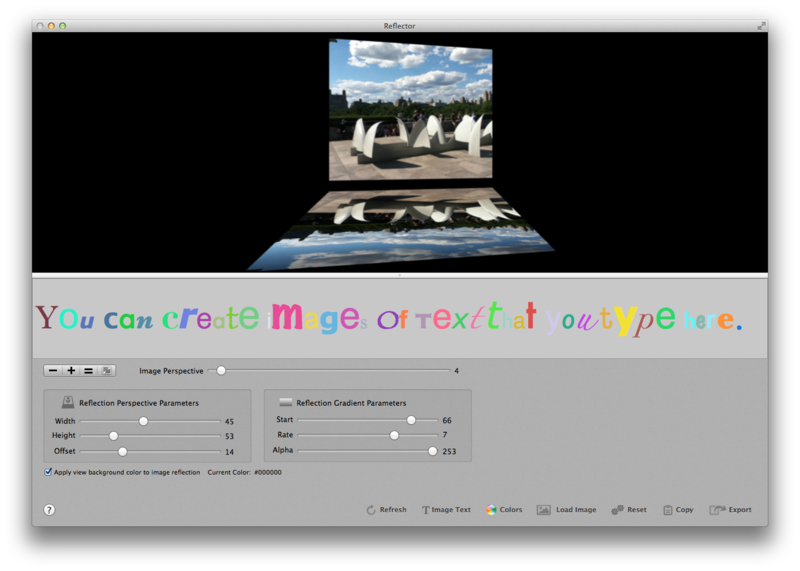 Adjust the reflection by varying its height, width, offset, alpha and gradient parameters. 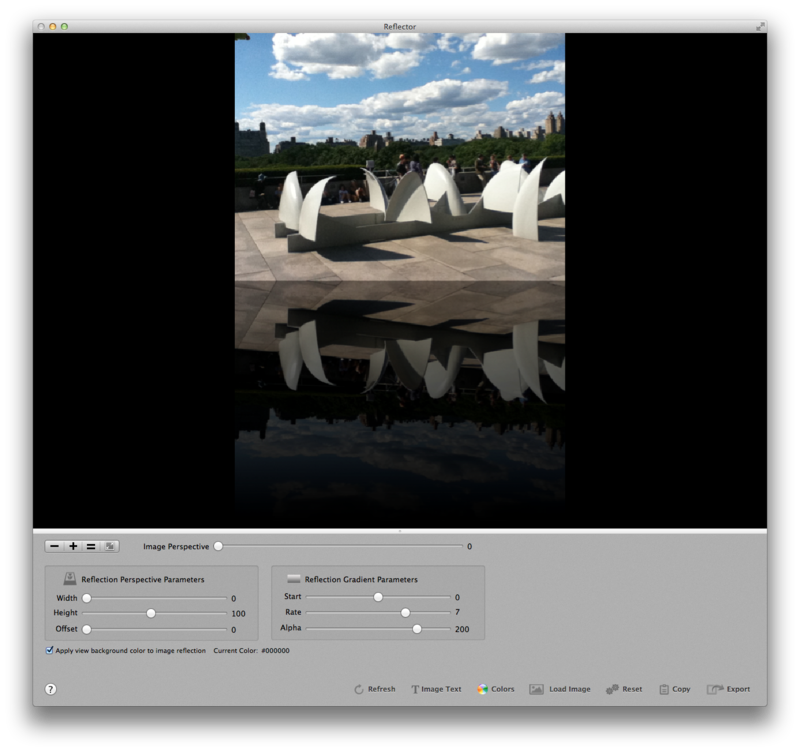 Vary reflection parameters to effectively create transparent copies of a photo using an alpha channel. Reset all parameters to factory values at any time. 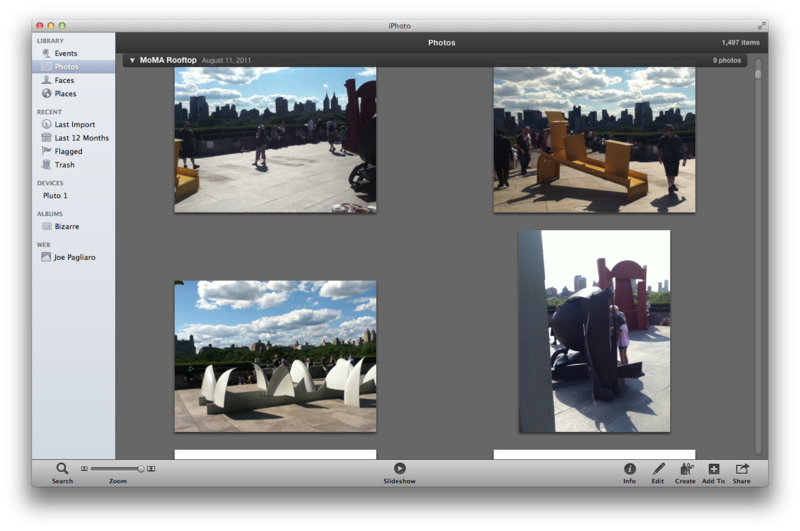 1) Locate the files you want to reflect in the Finder or iPhoto. 2) Drag the photo you want to reflect into the Reflector window's "photo viewer" at the top, or click the "Load Image" button at the bottom. 3) Use the window controls to customize the reflection. 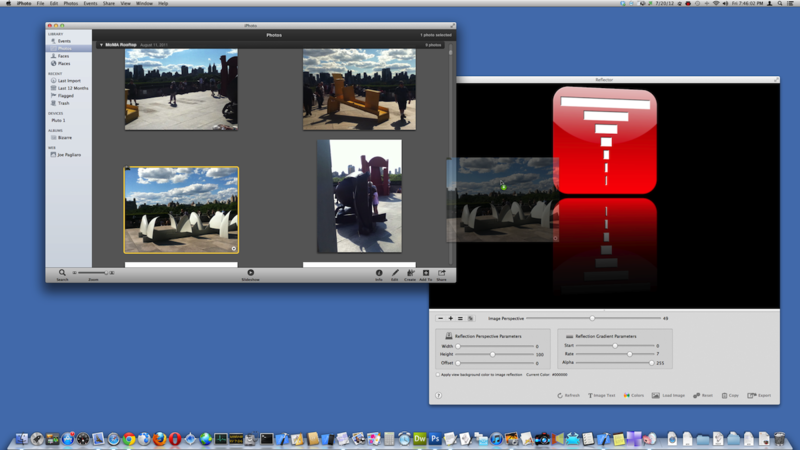 4) Use the "Export" button in the lower right corner of the window to save the reflected photo to a file. 5) Use the "Copy" button in the lower right corner of the window to copy the reflected photo to the clipboard, to paste into other apps. 1) Enter your text in the editor in the middle of the Reflector window. 2) Use the Format menu to stylize the text: you can apply font styles and set colors. Copyright © 2017 Limit Point LLC.